After a medley of trains, planes and even a nocturnal bicycle ride across LA (with dumpster-diving feed en route), here I am back in Quito. 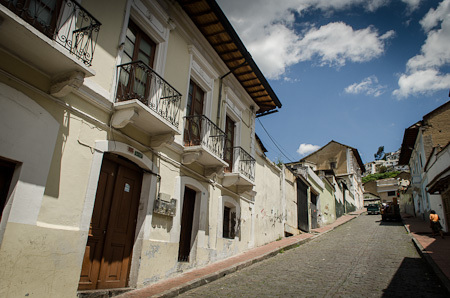 Or rather Tumbaco, a small town squeezed between steep, quilted hills, set some 12 kms to the east of Ecuador’s sprawling capital. And sprawling it certainly is. Despite its relatively modest population size – sub 2 million in number – this runner bean-shaped metropolis extends some 48kms in length, draped between a rugged corridor of active and dormant volcanos. The culture shock of such an arrival can be intense. It’s a time when senses are at their sharpest and their most impressionable; before the brain has a chance to adjust to the barrage of sensory experiences that bombard it. After a smooth transit through Ecuador’s immigration, I crammed my bicycle into the trunk of a cheap taxi sedan, resuscitating my neglected Spanish into life over small talk with its driver. 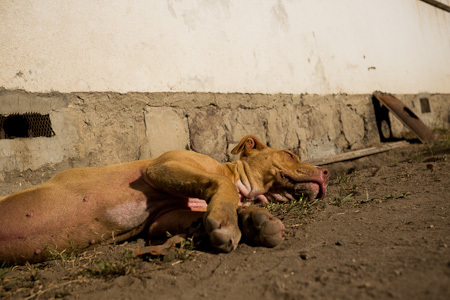 Luckily I had a home to head for that night, courtesy of Steve Tober – a teacher at a British school near Tumbaco – and his Colombian, elite-level mountain-running wife, along with their two kids. Steve has a passion for bicycle touring that courses strongly through his veins. Nowadays he concentrates his two-wheeled explorations around Colombia and Ecuador; pre-kids, he travelled all over around world. 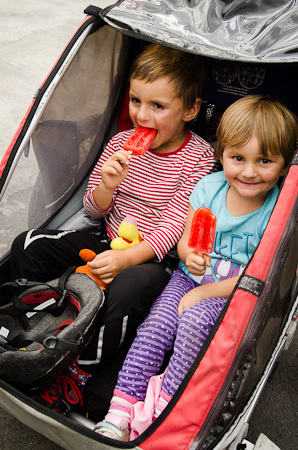 Check out his excellent blog if you ever question the plausibility of touring as a family in South America – his stories are inspiring. 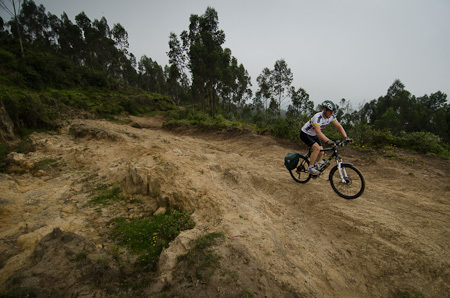 In fact, it was Steve’s local route-finding expertise and enthusiasm that I have to thank for one of my favourite rides: Tulcan to El Angel, via the otherworldly Paramo. And, no doubt, his guidance that I’ll be grateful for when it comes to the adventures that lie ahead. Indeed, it wasn’t long before we’d cracked out a collection of well-thumbed maps; now my head is spinning with possibilities for unbeaten path travel to Peru and beyond. It feels good to be back on the road, especially given my happier state of health than last time round. Although the sensation of returning to a nomadic lifestyle, after so long, is overwhelmingly one of excitement, I have to admit it’s tinged with apprehension. I’m back on my own, dealing with whatever life throws at me. Last time my journey to Ecuador took months; a slow, natural adaptation to Latin America. This time it’s been accelerated into a handful of hours. Almost immediately I’ve had the realisation – or rather the stark reminder – of how much more intense bicycle touring is here, compared to my recent journeys in South West USA. Which is probably what keeps drawing me back. Aside from the physical challenges of near vertical climbs through the Andes, there’s that infamous Latin American edge to contend with. And the cars too – and the frenzied, diesel belching buses – that drive with wild abandon. The glass-littered roads, mined with unexpected, cavernous potholes, or protruding with sculptures of contorted rebar. The Tober Rig: a hardtail pulling a tag-along pulling a Chariot trailer… Incidentally, the tag-along bike is 9kg, Ramon is 17kg, the Chariot trailer is 15kg, and Carla is 12kg. 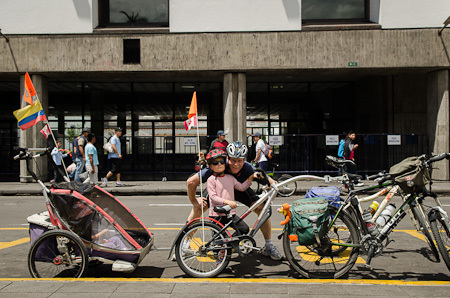 Add Steve’s bike and 10kg in the panniers, and you have some serious load hauling… Every Sunday, a car-free route – the Ciclovía – runs much of the length of elongated Quito, so we headed out en famille to rub shoulders with hundreds of Ecuadorian cyclists. The Tober Rig proved to be quite an eye catcher. The historic centre of the capital, which lies some 25 kilometres south of the equator. Hence the name of the country. The next morning, Steve and I awoke at the crack of dawn to head out for a day ride to Cumbre del Llalo. A chance to refamiliarize my legs with relentless Ecuadorian grades, the route covered the full gamut of terrain, including cangahua, dry mud moulded into a curious lunascape. 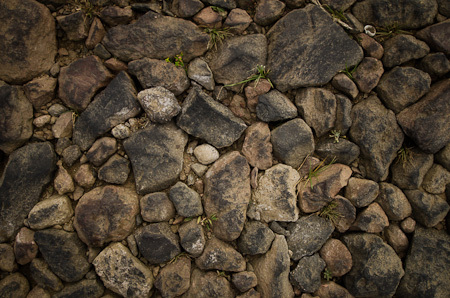 And, of course, the classic Ecuadorian cobblestone – empedrado – a filling-loosening surface that defies even the benefits of 29er wheels. During much of the ride, we were engulfed by a thick veil of cloud cover. 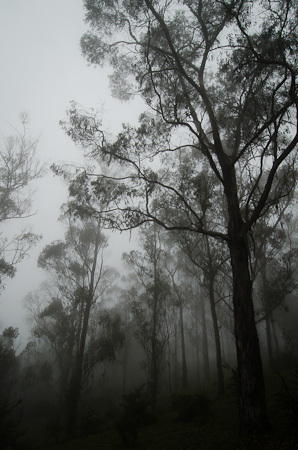 As we neared the top, we weaved our way through an alleyway of eucalyptuses poking out of the swirling mist. 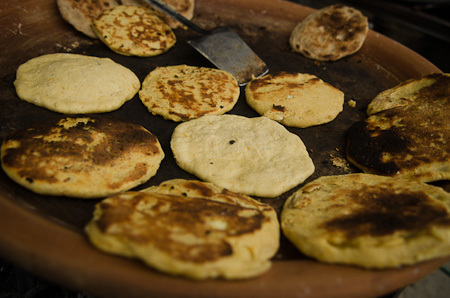 Let the street food feast begin… These tortillas de tiesto are made from wholewheat or corn, stuffed with cheese and sweetened with panela – unrefined whole cane sugar. Prepared on a traditional ceramic bowl, they go down a treat after a ride. 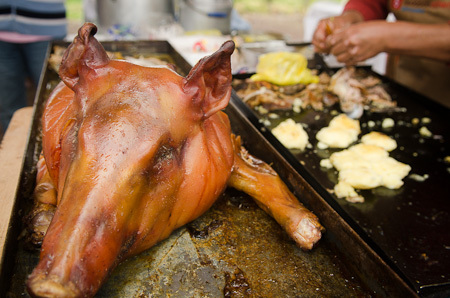 I did, however, pass on this poor fella – hornado de chancho – cooked in a large dome oven and served as seen. 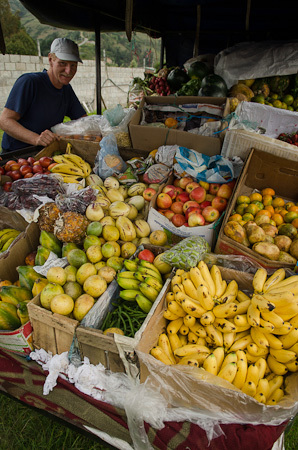 Another healthy boost: lush, tropical fruit sold at almost every street corner in Ecuador. Sometimes you don’t even have to go looking for it – it comes to you. 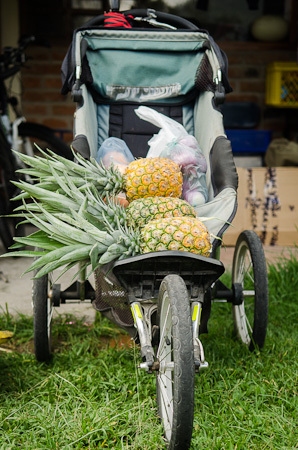 This open air fruit truck passes by Steve and Maria’s home every week to unload the latest in fresh produce. Incidentally, the Ogre arrived safe and sound. Although the flight was operated by American Airlines flight, booking through LAN Ecuador meant there was no excess baggage fee to pay, saving me the $150 charge I’d have been hit with otherwise. As usual, I used my Ground Effect Body Bag, bolstered with locally sourced cardboard. It folds down small to be forwarded onwards or sent home. 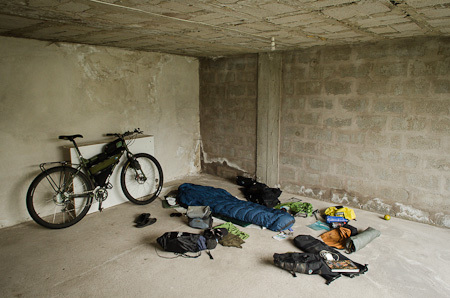 When I flew home from Quito last year, I’d left some panniers and gear at the ramshackle Casa de Ciclistas in Tumbaco, so I headed over to sift through long forgotten belongings. I set up camp in the open garage at the end of the garden, protection from the afternoon deluges typical at this time of year, before the dry season takes a firmer hold. My neighbour, Frenchman Arthur, who has ridden down from Mexico City. 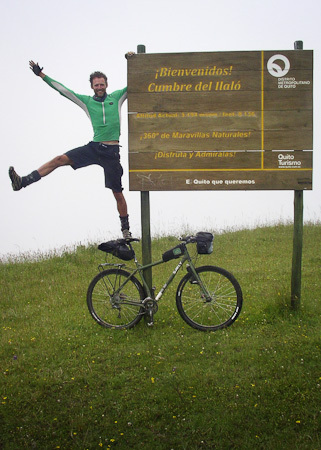 And Miguel, from Asturias, Spain, who’s pedalled up from Ushuaia, Argentina. 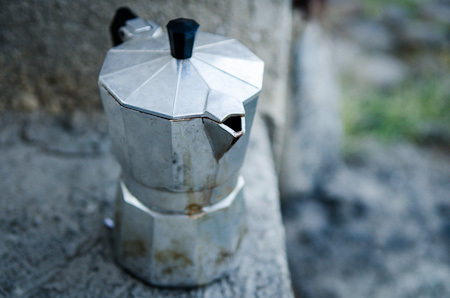 For the perfect cup of coffee you need, of course, a miniature caffettiera in your panniers. 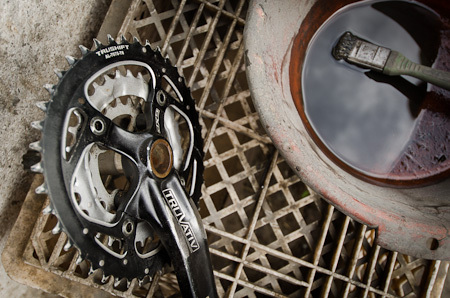 Gear talk… I hadn’t realised the Truvativ GPX crankset fitted to the Ogre wasn’t Shimano compatible – even standard Shimano chainrings won’t fit without modification. Luckily (for me at least), someone else had run into same issue. There was a damaged crankset amongst Santiago’s treasure trove of spares which I cannibalised for parts . For aspiring 29er riders, the good news is that the big wheel revolution has made it to Ecuador – or at least, to its high end bicycle shops. 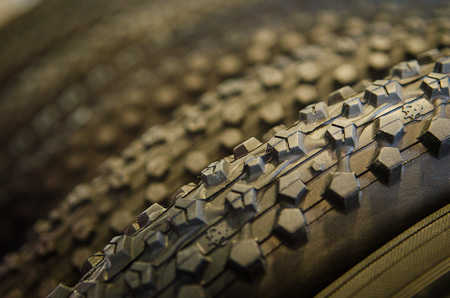 I noted an impressive collection of Maxxis 29er tyres were available, for as little as $23 each. Our hosts. 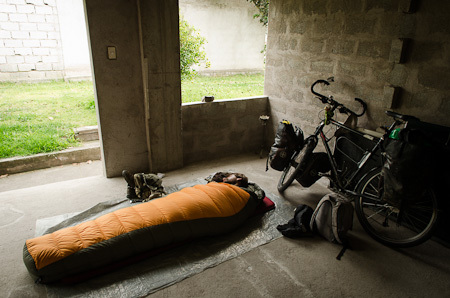 Santiago and his wife Ana Lucia have been receiving roving cyclists for over 20 years, offering them a place to pitch a tent, a workshop to repair their bikes and warmhearted, Ecuadorian hospitality. Roast guinea pig – cuy – is the real speciality here. They’re bred on the tops of rooves until occasion demands! I forgot the sesame seeds in the list of ingredients! ….and then shove one up yer arse and off you go! I really like the photo of Miguel and his bike. 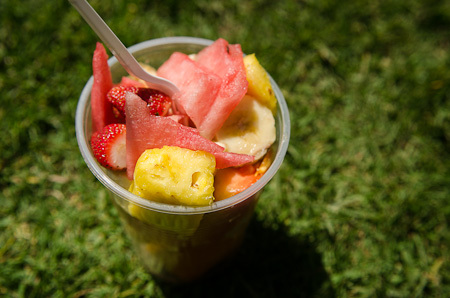 Seeing all that fresh fruit makes me jealous. Great to see you’re continuing from where you left of almost a year ago, I’m looking forward to see where the journey takes you. That Maxxis Ignitor in the photo used to be my favorite tire, I bet I’ve worn out close to a dozen of them. I stopped using them when they almost doubled in price. 23.00!!! Wow, they’re something like 65.00 here. It seems sort of odd that you’re so far away now. I can imagine the culture shock even though it’s much less for you than it would be for us. We’re looking forward to following your adventure. Ride safe! I think it was Ikons that they had too, which looked like a fast rolling option. I was pretty amazed by the prices too. Mind you, these are the beaded tyres rather than the folders. But at least you don’t have tax slapped on top! On the whole, high end outdoor gear seems to be around $15 more expensive here, but you can get pretty much everything. I even saw some Stan’s 29er rims! Kurt R speaks highly of the Ikon. That’s the tire he used for both the AZT and Coco. Andy also likes it. It’s light too. For touring the beaded tires ought to be just fine. It’s good to see 29ers are now a viable option for touring in Latin America, we should see parts gain in availability as time goes on. I’d have got a set if I hadn’t just got those Caballeros. Looks like a faster rolling tread. One at the back might be a good combo. Great to see you back on the southward road again 🙂 The last decent bike shop we passed before Cusco was in Loja, southern Ecuador… So stock up now! 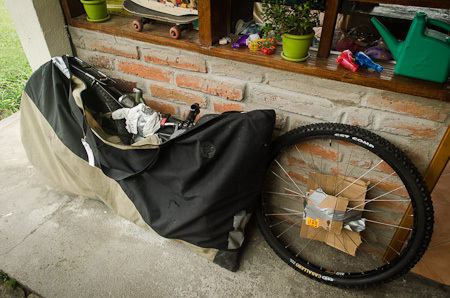 If you want anything 29er in Peru you’ll probably need to order it by overnight bus from Lima. Most things in Ecuador were cheap – it had the cheapest Petrol (Gasoline) on the entire continent!! Cool, thanks for that info. I’m carrying a spare, a Dureme folder, so fingers crossed. Then my mum is coming to visit me in Cuzco, so another chance for a resupply. Getting a nice route lined up, it’s been great to read through your notes for advice and inspiration. Met some local mountain biking/climbing experts, which has opened up a few off-the-map options. And, they ride 29ers! 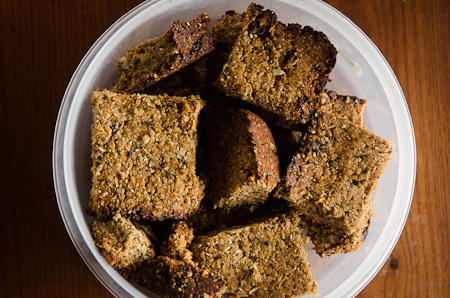 ….and that should read….oatmeal/quinoa flour….shove two up yer arse and you’ll really fly up those andean bumps…. look out for corinne and joseba (swiss & spaniard) , met them in the himalaya, they stayed with us in S.Africa while coming thru africa and they have just crossed the Equator a few km north of quito … so heading your way! I think that couple were supposed to come by Santiago’s place, but they might have bypassed it for the Casa de Ciclistas in Quito proper. I’ll keep a lookout. Also, Cass, can I please have a copy of your Quito to Cotapaxi GPS tracks? I’m en route to Quito and don’t think that I’ll have time to ride any further south but you never know, perhaps an opportunity for a light-weight sidetour will arise! Sure, I’ll email it when I next get the chance. 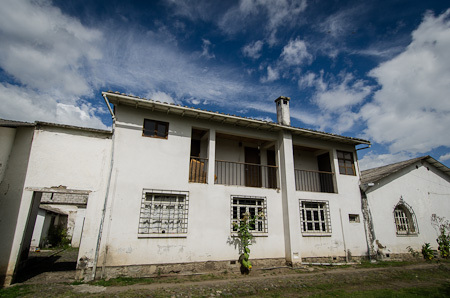 Note – it’s not entirely legal, passing through some private haciendas. No one seems to mind though. If you have time, I really recommend the Tulcan El Angel route, plus the climb and ride round to Lago Mojanda from Otovalo, on the way to Cayambe. And the ride from El Quinche to Tumbaco on the old railway line. A great finale! Good news about 29ers and Colombia! Thanks. No rush, I’m still weeks away! I guess they’re not everywhere but I rode briefly with a competitive mtber from Paipa and he told me that there were a bunch of 29ers around and that he was able to source parts locally. I’ve been eyeing off the Tulcan El Angel route, hoping to be there soon! Thanks for the inspiration!